Big, bold, beautiful, Batman is 80 years old this week. There’s just something about Batman. This week, the character introduced in the pages of Detective Comics turns 80 years old. And in that time, so many people have used his story to tell their own stories in ways that look different, feel different, sound different, but at their core, share one common thing: Batman. To celebrate this momentous occasion, the io9 staff has written about their fondest Batman memories. We invite you to read ours and then share yours below. The end of The Dark Knight Rises. Batman is my favorite. I’m well known for calling him my “boyfriend.” Clearly, I have issues. But I digress. As someone who grew up watching reruns of the Adam West-starring TV show, spent hours and hours with the outstanding Batman: The Animated Series, and still owns her Poison Ivy t-shirt from Batman & Robin, it’s actually a more recent memory of the character that sticks out. It was during my first viewing of The Dark Knight Rises, which is a so-so movie overall for me personally, but had an ending that completely ripped me to shreds. I don’t know why it hit me so hard—I wasn’t all that attached to this particular version of the character—but it did. In the comics, Bruce’s battle is never over. That’s both by nature of his comics being published continually over the last 80 years of course but also because he would never let himself stop. It’s not in his nature. I don’t know that I even believed it made sense for Christian Bale’s Bruce to leave that life behind (Gotham was still in pretty rough shape at the time after all! ), but he made the choice. He chose to be truly happy for once in his life. ...I think this might have slyly revealed my own issues of continually putting too much weight on my shoulders but hey, that’s the power of fiction. Stories help us go places we never imagined and realize things about the world we might not have otherwise. The depth and breadth of Batman’s countless tales is just one example of that. I grew up as a kid being raised on classic British comedy, from Fawlty Towers to Monty Python, and in particular, re-runs of the working class sitcom icon Only Fools and Horses, which followed the exploits of a pair of south London brothers named Del and Rodney trying to grift their way to financial success. The series ended the same year I was born, but it lived on through these repeats and through new Christmas specials every year—including 1996's “Heroes and Villains,” now considered one of the most beloved Christmas specials in UK TV history. It’s a hilarious moment, but at the time, kid me didn’t have the context of who the hell they were dressed up as. I didn’t know who Batman was (I was only 5! ), the absurdity of this portly man in a cape, his lanky brother in shiny spandex underwear, charging down a street was enough to make the scene funny to me. But it intrigued me to learn more—and so I went, from Del and Rodney to the actual 1966 Batman show, and from there, Batman: The Animated Series, then the comics...and the rest is Bat-History. It probably fundamentally shaped how I see Batman as a character—that the character can be capable of so much more than bleak darkness—and directly lead to my love of the classic ‘66 series as my Batman-of-choice. All it took was beloved comedic actor David Jason jogging down a dark street in fancy dress. The poster that started it all. Tim Burton’s Batman movies are where most of my Batman memories come from. I have a distinct picture in my head of seeing that first movie in theaters in 1989. I remember being very excited for Batman Returns a few years later and then very very very excited for Batman Forever after that. (Batman & Robin, not so much.) I can’t be 100 percent sure but I think it’s because of that first movie I started to watch the Adam West TV show every week, that I read The Dark Knight Returns, as well as other Batman related things. 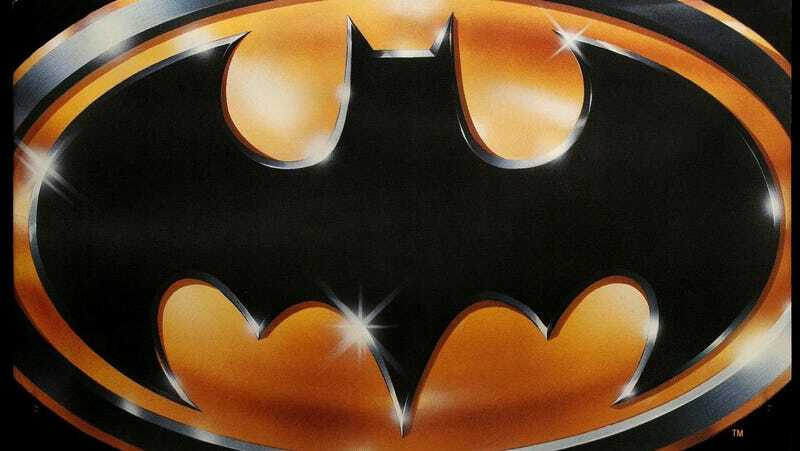 My most distinct memory in that time, though, was when the 1989 Batman came out on home video. As a fan, I was super excited to buy the VHS and a crappy old store by me called McRory’s had the poster up in their window. I walked in and asked if I could have that poster when they were done with it, and they said yes. That day came, I went to the store and I proudly brought that striking, awesome, Batman poster home. I slapped it on my wall with either push pins or scotch tape, like any true collector would. And so began an obsession with posters that lives in me to this day. All because of Batman. Who doesn’t love The Animated Series? My first experiences with Batman came by way of The Animated Series, but I don’t really remember being all that interested in Batman as a character until Batman & Robin. For me, the animated series’ draw was the sound design—specifically, the way that musical cues would wax and wane in this very smooth way that began with the opening and would gradually wind down to moments that were mostly silent and kind of serene. Batman Forever is so 1990s. Suddenly, though, Batman was everywhere. He was on the big screen played by Michael Keaton, he was on MTV as part of Prince’s incredible soundtrack, and—for some reason, I have a very vivid memory of this—he was on t-shirts everywhere you looked. I remember liking the movie, especially Jack Nicholson as the Joker, and I remember playing “Batdance” over and over after recording it off the radio onto one of my trusty mix tapes. But mostly I just remember this general envelopment of Bat-mania on a massive scale. Everyone had that t-shirt with the logo, everyone doodled bats on their school notebooks, and everyone walked around ready to throw out “Ever dance with the devil in the pale moonlight?” and “Go with a smile!” if the moment even slightly called for it. Danny DeVito’s Penguin was quite the character. My first memories of Batman are pretty innocuous. It was summertime and we’d play with the hose and then come in and watch the ‘60s show on a tube TV. Batman was colorful and dad-like, Robin was a kid just like us, and Batgirl was notably, the best part of every episode she was in. Where Does He Get All Those Wonderful Blogs?